We left Paris and spent the day on the road, headed to Bordeaux. The bus ride was long and draining, but we stopped at a few service areas along the way to get food and stretch our legs. We arrived to Bordeaux around dinnertime. The campsite was an in adorable, quaint town comprised of small cottage-like houses with flowers hanging from the window sills. 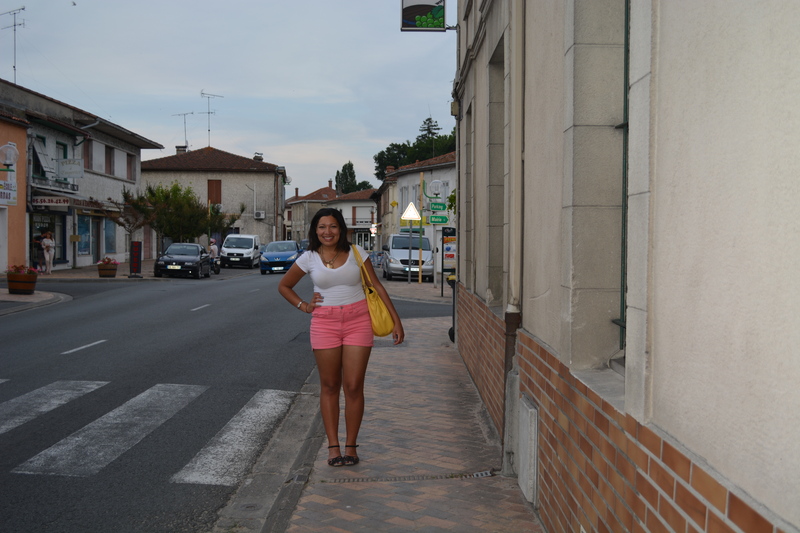 It was as picturesque as you would imagine a small French town to be. That night, we had a bit of free time so I walked around with some friends to explore the town. We got a couple bottles of Bordeaux wine, which the city is famous for, and headed back to the campsite for dinner. After dinner, some people headed to the river for a swim, while I went with a few others to a local bar in town to watch the France versus Switzerland FIFA World Cup match. It was probably one of my most favorite nights of the trip so far. I loved the communal spirit resonating in the bar as the locals cheered and shouted for their team. Still feeling sick from the previous day, I left the bar and headed to bed early to get some much-needed sleep. Rising at 6 a.m. the following morning, we packed up camp and headed out towards Pamplona, Spain. 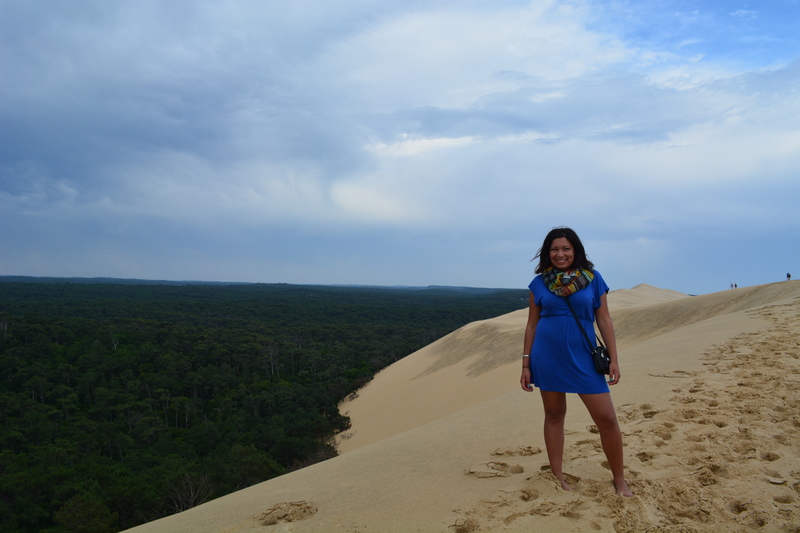 On the way, our tour manager surprised us with a quick detour to the Dune du Pyle, Europe’s largest sand dune. At first most of us groaned a little, thinking it would be a boring excursion through a mound of sand, but we soon found we were terribly wrong. We climbed to the top of the dune and were taken aback by the view from the top. The dune was situated right on the coastline, overlooking the ocean. On the other side, a vast, lush forest covered the ground. And in between, the dunes stretched for at least a kilometer, making the peak and awesome place to take pictures. We stayed there for less than an hour, but we had enough time to take a few group photos and watch some boys from the group roll all the way down the dune. Pretty badass. We soon left the dune and headed toward our next stop on our way to Pamplona. 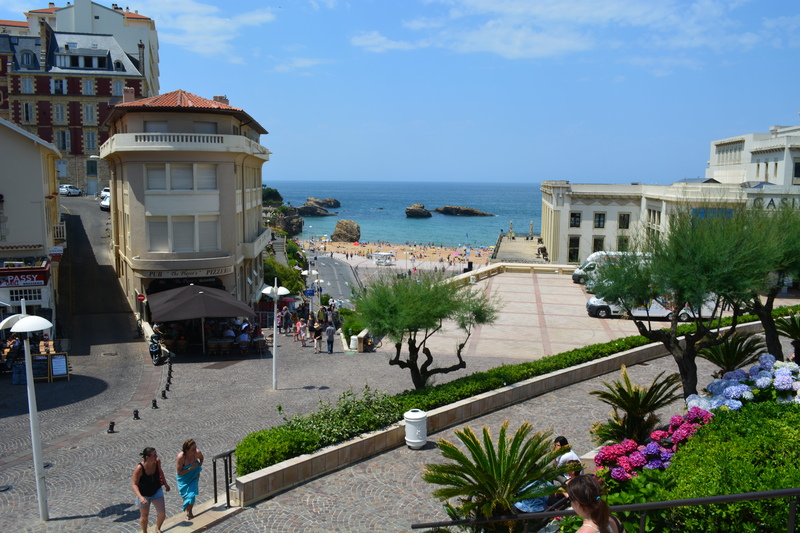 This time, we stopped at Biarritz, which I knew was a beach town, but did not realize how incredible a beach town it is. Biarritz is a ritzy area in the south of France, turned into a popular vacation spot by a king who used to live there. The streets are lined with expensive shops and boutiques and beachfront restaurants with breathtaking views. The water there was a deep, crystal blue and the coastline was split by huge, beautiful boulders protruding from the water. Instead of hanging out at the beach with the rest of the group, two friends and I walked up and down the shops along the beach, stopping for some necessities and exploring the local commodities. Oh to be rich! Our stay in Biarritz was short-lived and we soon continued on our way to Pamplona. After a two-hour ride, we crossed over the border into Spain and arrived in the city for a short walking tour and stop for drinks. Pamplona is one of the cities I have studied for years in my Spanish classes because of its rich culture and historical significance. This small town in the north of Spain is best know for its San Fermin festival, better known as the Running of the Bulls. Heard of it? Yeah. It’s when a bunch of crazy people run down a long path and have six bulls chase them to the bull ring, where afterwards the bulls are slaughtered. The festival lasts for more than a week, and has been a national tradition for centuries. We walked about the city for a few minutes, stopping at a statue of the festival. 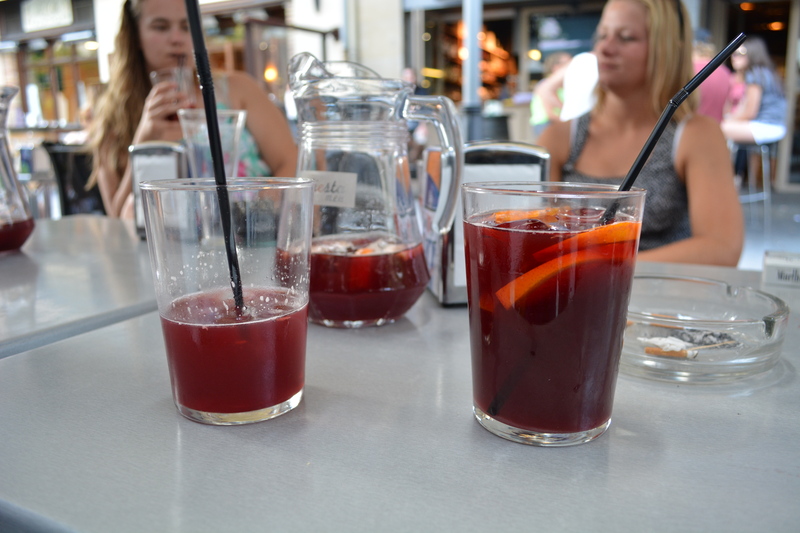 After snapping a few pics with the sculptured bulls and matadors, we continued into a local pub for some sangria. Of course, having spent the previous summer in Spain, I had already had my fair share of the fruity, delicious drink. But most of the Australians and other people on the tour from the Southern Hemisphere had never had it! And boy did they love it. The pub we went to made the drink extra strong and extra sweet. We split three pitchers between six of us and drank every last drop. It was the perfect drink on a hot day. The group then headed back to the campsite for dinner. We had a choice of stay at the campsite or go back into the city for a night out after dinner; and of course I wanted to go back into the city! I couldn’t pass up on a night out in Pamplona. Luckily, I wasn’t alone. About 20 of us shared cabs to go back downtown and we ended up in the famous square of Pamplona where the San Fermin festival begins. 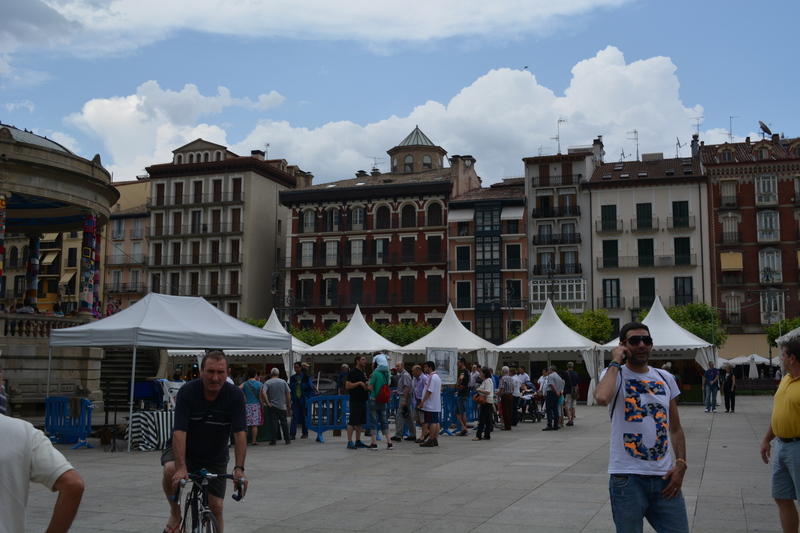 But during the rest of the year, the square is a popular shopping area with lots of bars and a few night clubs. We ended up at a pub in the square where we got mojitos, more sangria and a Spanish drink called kalimocho (red wine and coke). We helped turn the somewhat empty pub into a club by dancing up a storm inside. It was unbelievably fun standing around with everyone in a circle and taking turns showing off our skills in the middle. It was definitely one of the best nights yet. Bordeaux, Dune du Pyle, Biarritz and Pamplona were amazing places we only got to spend a a few hours exploring. I wish we had more time in all of them, especially Pamplona, but I was happy to head to Barcelona the next day! This sounds amazing!! I understand so much how you felt at the Dune, it’s so amazing! You’ve been? Yes! It was breathtaking! I just wish I wasn’t chicken and had run down the hill like my friends did! Maddi, sorry for the late response! So I’m guessing you’ve been by now? What did you think?! I wish I had been there longer!